I have to say, I was quite excited when I heard about the REV'IT! Pioneer OutDry Boots for this Fall 2016 launch. Before I discovered life on two wheels, I did most of my exploration with my own two feet in the form of backpacking and camping, and these boots tap right into that hiking DNA while still providing the required protection for motorized travel. You may look at these boots and think they belong on the shelves of your local outdoor recreation store, and you wouldn’t be far off. The fully-waterproof OutDry® shell will not saturate with water, making this boot a prime contender for all-weather riding and soggy off-the-bike exploration. What really shows REV’IT was trying to - ahem - pioneer the ADV boot with this model, is the fact they developed an all new sole composition in conjunction with the renowned Italian company Vibram®, who are responsible for the soles of the most technical hiking and mountaineering boots on the planet. The Vibram® Apex sole was specifically developed for adventure motorcycling, which means it is the best of both worlds. Additionally, REV’IT has taken the BOA® closure system found on many ‘speed lace’ style hiking shoes and decided it shouldn’t be such a chore to lace or buckle up your motorcycle boots. A single turn of a knob will ensure a perfectly secure fit. Now, with all these rugged features, you might be left wondering what they actually did for protection. Well, they have managed to use their famed SeeSoft protection at the tongue, almost like a low-profile version of the shin protection you’d find in a taller boot. They’ve also put thermoformed inserts at the heel and toe, with an injected cup at the ankle to keep it in place. 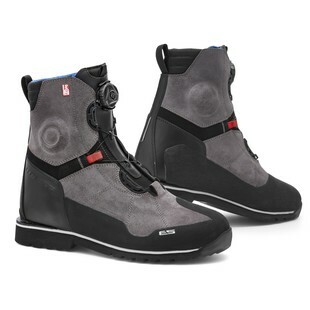 All told, this boot sounds like it is set to raise the bar for adventure touring footwear. I am excited to see the functionality of the trekking world start to trickle over into the motorcycling industry - who doesn’t want to stretch their legs on a nice hike after riding to their destination? With the REV’IT! Pioneer OutDry boot, you won’t have to think twice about heading off into the mountains.